Top Ethiopian engineer Simegnew Bekele, whose death from a bullet wound in July sparked a huge outcry, took his own life, police say. Mr Simegnew's body was found in a car in the main square of Ethiopia's capital, Addis Ababa. The engineer was in charge of the country's controversial multi-billion-dollar project to dam the Nile. At the time, Prime Minister Abiy Ahmed said he was "saddened and utterly shocked" by the news of Mr Simegnew's death. At his funeral, police used tear gas to control the thousands who had gone to pay their respects. After more than a month looking into the engineer's death, the authorities found "that he used his own gun and killed himself," police chief Zeinu Jemal told journalists. Mr Simegnew's fingerprints had been found on the gun and the doors of the vehicle were all locked from the inside, the police chief added. 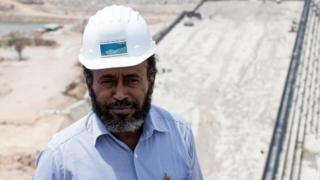 Commenting on what could be behind the suicide, Mr Zeinu said preliminary investigations suggested that Mr Simegnew may have been under pressure because of the delays and the increasing cost of the Grand Ethiopian Renaissance Dam. But, he said, more investigations need to be carried out. The dam, which has been called the most ambitious infrastructure project ever achieved on the continent, was supposed to have been finished two years ago. Now, seven years into construction, it is only 65% complete, reports the BBC's Abebe Bayu. The project is also expected to go over its $4bn (£3.1bn) budget. Once built, the 1.8km (1.1 mile) wide and 155m (500ft 5in) high dam will triple the country's electricity production. But it has created geopolitical tension downstream on the Nile, with Egypt worried that the infrastructure project will put a strain on its water supply. Matina Stevis-Gridneff, Africa correspondent for the Wall Street Journal who knew Mr Simegnew, said he had come to represent Ethiopia's patriotic ambitions. "He was someone who was extremely patriotic and had devoted his life to the betterment of his country," she told the BBC's Focus on Africa radio programme.